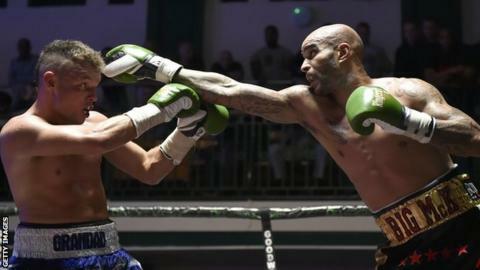 Leon McKenzie says boxers need to keep "trash talk" professional, after he felt comments about his depression by John McCallum "went below the belt". McKenzie, 37, defeated McCallum in October, leaving the former Norwich footballer undefeated in eight bouts. "There's trash talking and trying to sell tickets, and then there's going below the belt by mentioning personal issues," he told BBC Radio Norfolk. "There's a thin line in regards to keeping it professional and he didn't." McKenzie - whose father and coach is former British and European boxing champion Clinton McKenzie - has previously revealed he attempted to take his own life while suffering from depression. He added: "He mentioned a few personal things that I speak openly about with regards to people that suffer from depression. It's a part of my life, I've learned to cope with certain things. "He just went below the belt and I felt that was unnecessary for the profession that we are in, and come fight time all was said and done, he got his." McKenzie also confirmed he had a fight lined up for 30 January against an unnamed opponent. "I'm on my own journey, I train hard, I've got fantastic pedigree behind me and we're winning," said McKenzie. "We've got a good stable with my dad and (uncle) Duke McKenzie and so many good people round giving me information. "But I've been in this since I was a kid even before I started kicking a football - everyone's got to start understanding it's in my DNA and that's why I'm able to even do what I'm doing."